I left the self destructing device named procrastination. Did you??? 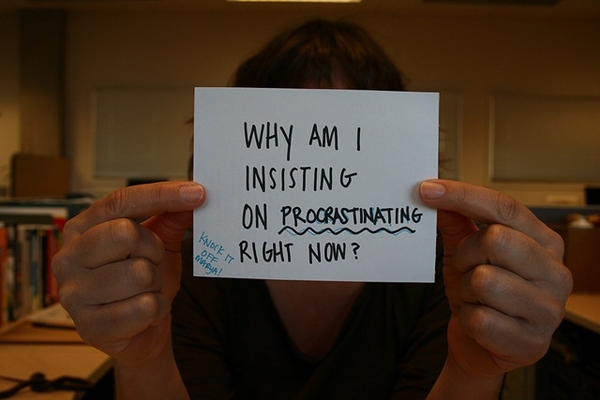 Never to be picked up again, I left the self destructing device named procrastination. Did you??? It was time I decided to be more productive. I was damn enthusiastic. My nerves ran with more of inclination towards being a writer. Plunging into buying loads of paper and stationary was so easy; setting up a writing atmosphere took a shape too. My husband looked so amused by my deeds and the spirit I’d shown up those days. He helped me with whatever he could in assisting. He was obviously overwhelming with joy to see me sprouting. He knew that I was tortured miles deep into the heart. He knew that I was rising by myself now. He might have thought that peace and progress is now unattainable for me. But watching me emerge, his happiness knew no boundaries. I started writing short stories, poetry and small articles in my mother language and kept sending them for publishing. To my surprise, not even a single write up was rejected or came back unpublished. I started writing more and more. It was a feeling of satisfaction and there was a vent to pour out my feelings and thoughts. When two stories got published within a period of quick succession of two months in the same magazine, my poetry was just flowing in every weekly issue of the magazine. Whatever I wrote was instant and I never liked to leave anything incomplete. But the clause was that, it should get completed in one throw. Once I leave the write up half way, I am sure; it would never go complete in any way. This was the biggest drawback in me. Pending projects turn sad and pale. What to do? I was like that. Then time came in such a way that I got too much busy with the job and family that I hardly found time to write at length. This made me think that I could never write again until and unless I got time to jot on continuously till end. Once my son started crawling, I left everything and never knew how time flew to show me a distance of 6 years without me going creative in any way. I was deeply immersed with my son’s brought up. I could manage being constantly writing (freelancing as an academician for a Telugu news paper and a Government magazine) but my creative writing went down. One day when I happened to be the member of a writer’s organization, watching the emerging poets and writers made me think. What was I doing about my creative writing? The skill which gave me immense joy and content was stamped under one simple weakness that I can’t keep something pending even for a day. I lost 5 years of time as a result. Then I decided that every thing can’t be taken for granted to be written at a length, at a time. I started breaking the projects I took up into frames/bits. When I had to write an article, I would give it 4 to 6 days time. One day would be for framing and working on the details of the subject, one day gathering anecdotes and statistics required, 2 days to write the framework and 1 or 2 days to finalize the copy and send it away to the magazine. This made my work easy. The pain of stress or the agony of incompletion never haunted me again. I could give a bit of emphasis in between on my poetry and reading different ebooks. To get motivated and keep my success rate high, I switched to a stipulated time table but started enjoying the work. I drew myself from the borderline of negligence to the centre point of consistency. Sedentary lifestyle came to an end when I started going on journey’s to explore things for my articles. It gave me broader outlook on different aspects and the evolution sprouting, gave a new vision to experiment. Boundless freedom to explore various curtailed incites gave into loving the passion I flamed inside. Unlike today, the days of procrastination and negligence stole me of my quality writing. There is no tomorrow for me for the work I have to do now. There is no next week, if I have to complete a task this week. This strict rule implemented handed over a peaceful work out for me. So guys, procrastination is just an evil and believe me, it’s absolutely self destructive. Shed it and see….life becomes easier! •	Know this fact that leaving procrastination gives you liberty. •	Sticking to the schedules gives energy and boost up to work for the next task. •	Procrastination kills your creativity and your opportunities too. •	Practicing consistency leads to success in any aspect. •	Ensure always that you are working according to your energy levels. •	Remember- planning is very easy but to implement needs your dedication. •	Jot down the instant ideas and keep you busy working on them in a scheduled frame. •	See that you are organized but not fussy.